Sebastian Vettel, juara bertahan Formula Satu. Formula Satu musim 2014 merupakan gelaran ke 65 dari kejuaraan balapan mobil formula tempat duduk tunggal yang diselenggarakan oleh FIA. Dibawah ini adalah sembilan belas Grand Prix yang akan ambil bagian di musim 2014. † — Pembalap gagal menyelesaikan lomba, tetapi berhasil menyelesaikan lebih dari 90% dari jarak lomba. ^ a b "World Motor Sport Council". FIA.com. FIA. 4 December 2013. Diakses tanggal 5 December 2013. ^ a b Elizalde, Pablo (27 September 2013). "New Jersey and Mexico on 22-grand prix 2014 Formula 1 calendar". Autosport.com. Haymarket Publications. Diakses tanggal 27 September 2013. ^ "World Motor Sport Council". FIA.com. Fédération Internationale de l'Automobile. 27 September 2013. Diakses tanggal 27 September 2013. ^ "2014 FIA Formula One World Championship Race Calendar". Formula1.com. Diakses tanggal 4 November 2013. ^ "2014 FIA Formula One World Championship race calendar". Formula1.com. Formula One Administration. Diakses tanggal 9 March 2014. ^ "So, CT05 (yes, it is CT05, not CT04) is up and running..." Caterham F1 Team. 28 January 2014. Diakses tanggal 28 January 2014. ^ "Caterham to retain Renault engines in 2014". GPUpdate. 24 May 2013. Diakses tanggal 24 May 2013. ^ a b c d "Renault unveil 2014 turbo engine". Formula One World Championship Limited. 21 June 2013. Diakses tanggal 20 October 2013. ^ a b Beer, Matt (21 January 2014). "Caterham signs Kobayashi, Ericsson for 2014 Formula 1 season". Autosport.com. Haymarket Publications. Diakses tanggal 21 January 2014. Caterham has signed grand prix returnee Kamui Kobayashi and GP2 graduate Marcus Ericsson for the 2014 Formula 1 season. ^ Collantine, Keith (24 January 2014). "New Ferrari named F14 T by fans' vote". F1 Fanatic. Keith Collantine. Diakses tanggal 24 January 2014. ^ a b c "Presentation of the new Ferrari power unit". ferrari.com. Scuderia Ferrari. 20 December 2013. Diakses tanggal 20 December 2013. ^ "Fernando Alonso signs new Ferrari contract". BBC Sport. BBC. 8 March 2012. Diakses tanggal 19 May 2012. ^ a b c d "Mercedes names 2014 F1 V6 Engine 'PU106A Hybrid'". This Is F1. Diakses tanggal 23 January 2014. ^ Collantine, Keith (6 January 2014). "Lotus will not have new car ready for first test". F1 Fanatic. Keith Collantine. Diakses tanggal 7 January 2014. ^ Lopez, Gerard. Interview with Michael Schmidt. Es kommen keine neuen Schulden dazu. 15 January 2014. Diakses pada 15 January 2014. ^ a b "Pastor Maldonado will join Lotus in 2014 alongside Romain Grosjean". SkySport F1. Diakses tanggal 29 November 2013. ^ "Marussia_F1Team". @Marussia_F1Team. Twitter, Inc. 15 January 2014. Diakses tanggal 16 January 2014. Great to see @Jules_Bianchi in the house today, eyeing up the new #MR03. We said "smile" & @Rory_f1 kindly obliged! ^ "Jules Bianchi will remain with the Marussia Formula 1 team for 2014". Autosport.com. Haymarket Publications. 3 October 2013. Diakses tanggal 3 October 2013. ^ Noble, Jonathan (7 January 2014). "McLaren reveals new F1 car launch date". Autosport. Jonathan Noble. Diakses tanggal 7 January 2014. ^ Noble, Jonathan (16 May 2013). "McLaren believes switch to Honda engines will not compromise 2014". Autosport.com. Haymarket Publications. Diakses tanggal 17 May 2013. McLaren believes its world championship challenge with Mercedes next year will not be compromised by its planned switch to Honda engines for 2015. ^ Collantine, Keith (13 November 2013). "McLaren: Button's 2014 team-mate not signed yet". F1 Fanatic. Keith Collantine. Diakses tanggal 1 November 2013. ^ "Mercedes poised to roll out their new W05 on first day of 2014 testing at Jerez". SkySports F1. Diakses tanggal 7 January 2014. ^ a b Straw, Edd (26 May 2013). "Toro Rosso seals Renault Formula 1 engine deal for 2014". Autosport.com. Haymarket Publications. Diakses tanggal 26 May 2013. ^ "Horner pleased to end Vettel rumours". Autosport.com. Haymarket Publications. 14 March 2011. Diakses tanggal 7 April 2014. ^ "Sauber C33 passes crash tests". ESPN F1. 11 December 2013. Diakses tanggal 11 December 2013. ^ Straw, Edd (21 December 2013). "Sauber confirms Esteban Gutierrez will race for the team in 2014". Autosport.com. Haymarket Publications. Diakses tanggal 21 December 2013. Esteban Gutierrez will remain with Sauber for a second season in 2014, the team has announced. ^ "Adrian Sutil moves to Sauber for 2014 Formula 1 season". autosport.com. Haymarket Publications. 13 December 2013. Diakses tanggal 13 December 2013. ^ "The Shortest Month". scuderiatororosso.com. Scuderia Toro Rosso. 3 January 2014. Diakses tanggal 4 January 2014. On the Scuderia Toro Rosso front, the first STR9 chassis is currently being assembled in the Faenza factory. New rules or not, the same procedures apply and over the Christmas period Jean-Eric Vergne and Russian rookie Daniil Kvyat turned up at the factory for the traditional seat fitting in the new chassis that will carry all our hopes in 2014. ^ a b "2014 Scuderia Toro Rosso Driver Line-Up". Scuderia Toro Rosso. Scuderia Toro Rosso SPA. 21 October 2013. Diakses tanggal 21 October 2013. ^ "Williams Formula 1 team unveils its Martini livery". Autosport. Haymarket Publications. 6 March 2014. Diakses tanggal 6 March 2014. ^ "@WilliamsF1Team". Twitter. Twitter, Inc. Diakses tanggal 19 January 2014. ^ "The Williams F1 Team and Mercedes-Benz announce long-term engine partnership". 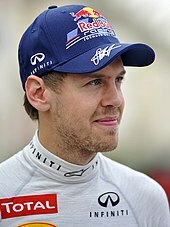 WilliamsF1.com. Williams F1 Team. 30 May 2013. Diakses tanggal 30 May 2013. ^ "2014 FIA Formula One World Championship Entry List". FIA.com. Fédération Internationale de l'Automobile. 10 January 2014. Diakses tanggal 10 January 2014. ^ "Formula 1's governing body confirm drivers' numbers". bbc.co.uk/sport. BBC Sport. 11 January 2014. Diakses tanggal 11 January 2014. ^ "Teams and drivers". Formula1.com. Formula One Administration. Diakses tanggal 10 March 2014. Halaman ini terakhir diubah pada 18 Februari 2018, pukul 14.28.